Image Description: In the style of Super Smash Bro. 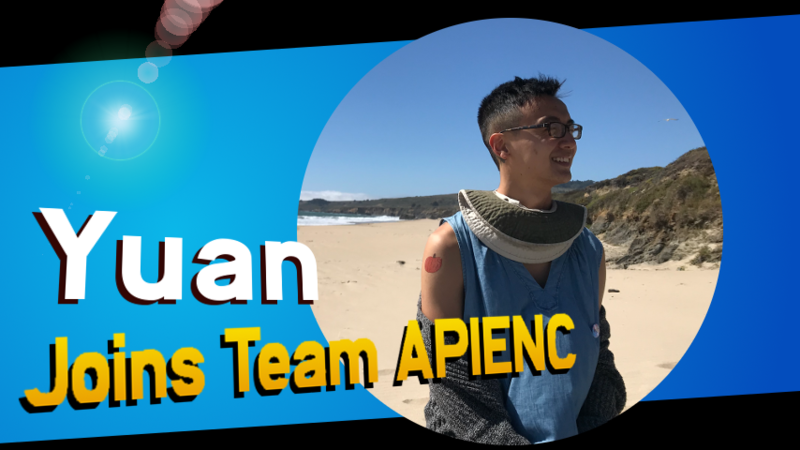 when a new character is unlocked, text in light colors against gradient blue background reads, “Yuan Joins Team APIENC”, overlapping circular photo of Yuan smiling at the beach. My name is Yuan Wang; I’m writing to you as the new Community Organizer at APIENC! As a trans/genderqueer second-generation Chinese-American person, I first joined APIENC in the summer of 2018 as a summer organizer. Now, I’m so excited to join the team as a staff-person, supporting our trans justice work! Today, I want to write to you about what interdependence means to me. When I joined APIENC as a Summer Organizer a year ago, I showed up to a warehouse in West Oakland, full of nervousness & wonder. Inside, I was met by Sammie, who led me and other new organizers through a workshop on “radical welcome.” Our first afternoon together, our role was to help folks know they were entering into a space committed to their safety, access, and belonging. At the time, I couldn’t have known how my few months working at APIENC would be a challenging, joyful practice in giving and receiving radical welcome. When I started the current leg of my gender journey, I needed radical welcome, and I needed APIENC. Each day, I woke up feeling frightened, unsafe, and unsure. I felt I needed to reimagine the most basic things about myself, from my name, to my pronouns, to the ways I held my body each day. So many people around me responded with confusion and anger—It felt so hard to imagine a place for myself in this world. Through the hardest moments, it was my connections with others that sustained me. On a particularly painful day, when everything felt too scary for me to leave my bed, a roommate left a string of notes outside my door. The notes said that they loved me, that I mattered, and that they would do their best to keep me safe. Years later, I met a community of queer, trans, & GNC Asians and Pacific Islanders (that’s you, that’s you!) at APIENC who all held me with the same care. You all help me breathe in my body with love, lean into building genuine trust, and understand how the ways we treat each other must reflect the liberation we seek. Together, we fight hard while grounding our struggle in our relationships and in ourselves. In the spirit of community care, I want to ask for your help with one of my first jobs as Community Organizer: fundraising for GiveOUT Day 2019, the only national day of giving to LGBTQ+ organizations. This year, APIENC, led by members like you, will stretch & grow; we’ll train our 10th Summer Organizer cohort (ahh! ); host a Leadership Exchange for local API leaders; organize a large needs assessment of the TGNC API community in the Bay Area; deepen the intergenerational care connections in our Dragon Fruit Network; and so much more. To do all of this, we rely on each other, and we rely on YOU. 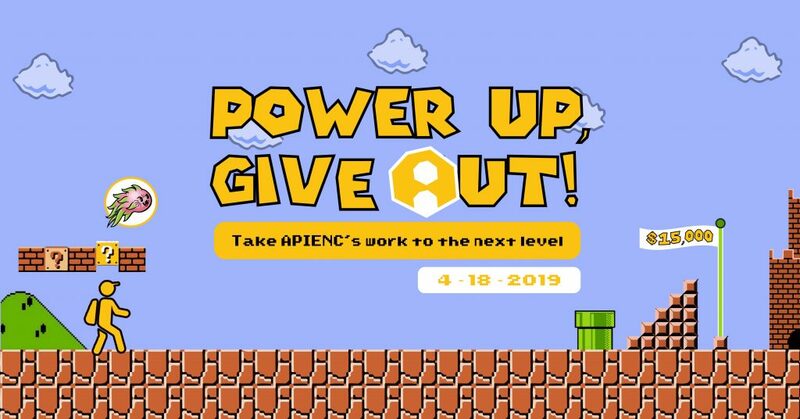 To ensure our work can continue, APIENC is asking our community to help us “Power Up & Give OUT!” by raising $15,000 from 300 donors. We have 10 more days until GiveOUT Day ends on April 18th at 9pm PST. Can you donate $30 to help take us to the next level? Become a volunteer fundraiser to activate your communities to learn about APIENC! Join us on GiveOUT Day, we’ll be live streaming on 4/18 from 12pm-1pm and 6:30pm-8pm! As I transition into this role, I feel a lot of nervousness! But I also feel so grounded in my intention to grow genuine and care-full relationships with you. I hold a deep gratitude for every person who I’ve met through APIENC; in so many small moments, I feel joy and possibility in just our existing together. In the next year (and after! ), please always feel free to reach out if you have any questions, or if there are any ways I, and APIENC, can hold you in your journey. This entry was posted in frontpage, marquee by API Equality. Bookmark the permalink.